Photo: Hieu Van Le says he is humbled by the appointment. 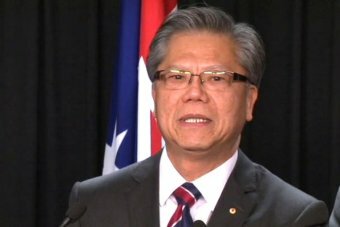 Former Vietnam refugee Hieu Van Le has been named as South Australia's next governor. Mr Le, the current deputy, will replace Rear Admiral Kevin Scarce from September. Premier Jay Weatherill said Mr Le had a great life story, having arrived in Australia from war-torn Vietnam as a refugee 36 years ago. "[He is] the first Asian migrant to rise to the position of governor in our state's history," Mr Weatherill said. "He has already demonstrated an outstanding level of service to the community and I have no doubt that he will serve the role with great distinction, as he has done in the role of Lieutenant-Governor since 2007." Mr Le worked as an accountant until he retired in 2009 and was made an Officer of the Order of Australia in 2010. Mr Le says he is deeply honoured and humbled by the appointment. "It is the stuff of a fairy tale to be honest, and I'm still trying to come to terms with that right now," he said. "As a young boat people refugee, I arrived here 36 years ago with nothing but an invisible suitcase filled with dreams, [with] a dream to live in a peaceful, safe and free country and to live a meaningful and fulfilling life. "But to be bestowed with the greatest honour and the privilege of holding the vice-regal office is absolutely beyond my wildest dream. "This appointment, however, says much more about our society than about me. It sends a powerful message affirming our inclusive and egalitarian society." Mr Le later spoke to the ABC's PM program in which he recalled some of the anti-immigrant views he experienced after arriving in Australia. "I did hear from the newspapers and radio talkbacks and all that sort of thing, even in Federal Parliament as well as the State Parliament, there's a lot of statements made about the boat people, about the diseases that they may bring to this country, and weren't a member of the society and that kind of thing. "G'day mate" was the unexpected greeting for Hieu Van Le more than three decades ago when he was among the first Vietnamese boat people to arrive in Australia from his war-torn country. "Yes, it started just like any other new wave of migrants, we call cop with some sort of criticism and negativity at first. "But then after the first couple of years, with all kind of headlines and everything about the Vietnamese, we're becoming so quiet, so unremarkable, and I think that is a good sign and that's a sign that we are totally integrated into the society to the extent that it's become unremarkable. "Until, I have to say, until when Pauline Hanson made a speech in Parliament, then there's some part of the society started moving up and some sort of a negativity, but then after that, it was just very short-lived." Cancer Council SA chief Brenda Wilson will succeed Mr Le as lieutenant-governor. Mr Weatherill has thanked Rear Admiral Scarce for his work. "His Excellency and Mrs Scarce have been outstanding advocates for South Australia in their roles," he said. "I know many South Australians appreciate the contribution His Excellency has made as patron of more than 200 charities and organisations across the state. "He has been tireless in his efforts to support the economic and social wellbeing of South Australians." Grandstand cricket commentator Jim Maxwell gives his player ratings for a disappointing Australian team following their loss to England in the first Ashes Test at Cardiff. A severe weather system brings blizzards, snow, heavy rain and gale-force winds to areas of south-eastern Australia. It is a short trip across the sea from Turkey to Kos in easternmost Greece, but for migrants fleeing conflict the journey begins much further away — in Syria, Iraq, Afghanistan or Pakistan. Russians are feeling the pinch of trade sanctions placed on them following the downing of MH17. With Shorten on the ropes, are we facing a snap election?